The Libre Original is a unique and inspired tea gift - the Libre glass ’n poly Original has a health-conscious glass interior for fresh taste and a durable polycarbonate exterior for ‘on the go’ practicality. 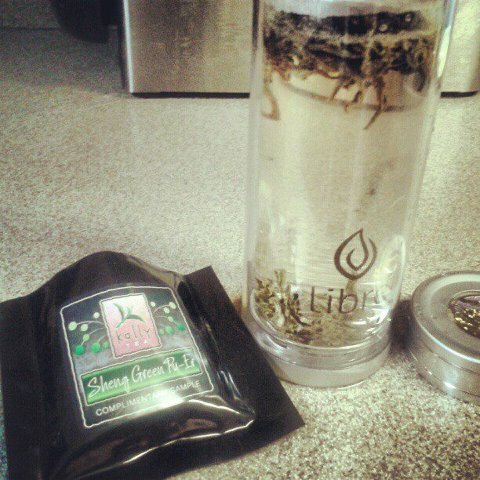 The stainless steel tea filter is surrounded by BPA free polypropylene as is the lid interior. Can be used 2 ways to brew and travel with loose leaf tea - 'how to' video here. Easy to fit in packs, purses and car cup holders. I tried it first with Kally Tea Green Tea (review coming on them!) 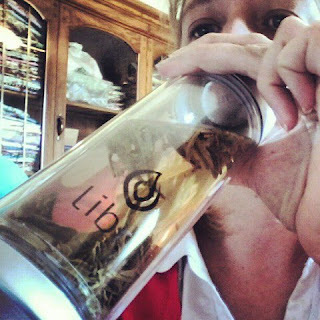 using the brewing option where the tea leaves stay right in the libre tea glass while you drink it. What is amazing is that the tea glass doesn't get too hot to hold on to! I thought maybe the tea wasn't hot enough when I held on to it. Wrong!! The tea was plenty hot, the tea glass just isn't. That is a plus for me with Littles running around and trying to grab my mugs and cups. But note to self.. remember the tea is still hot!! Not to the touch, but inside so keep the minder so your tongue doesn't lose taste buds! It does take a little getting used to drinking out of the tea glass as my nose hits the other side, but for a on the go glass I could get used to it. It actually is pretty fun to see the tea leaves floating in the glass, but not getting in my mouth! Looks really cool, I am easy ammused I know! 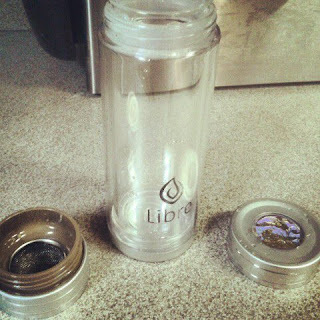 Libre Tea is giving my readers a Libre Tea Glass during the Mom Me Time Giveaway April 22-28. Watch for Giveaway details then! Be sure to visit Libre Tea at their many web venues!! Share a tea moment with them! This is just pretty neat and handy. I use a lot of loose leaf teas, this would be great to have. Very cool. My hubby would LOVE this!! Very cool. I love tea! What a unique design. for tea drinkers this seems to be a helpful design. This is pretty neat. I could probably put it to good use. I like all your stuff, very cool designs! This looks awesome! I could definitely use it. I have a friend that loves specialty teas. Great present idea. I drink a lot of tea and would so love one of these. Thanks for the review and pictures! I've been thinking about getting one but was worried it be too hot to hold- thanks for addressing that! This is neat. I love tea so this would be cool to try out. I'm not sure how I'd like to see the tea leaves floating but I do love it that the outside of the glass doesn't get hot! This is a great idea. This would be great! I have some loose tea and this would be so convenient! My daughter would love this! She loves her tea! Interesting and very cool design! i loveeeee these! i drink tons of tea.